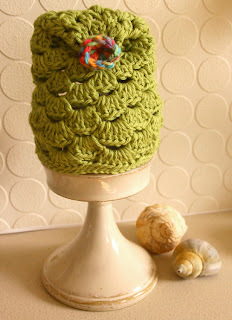 I have been quite busy of late, creating some small hats........and by small I do in some cases mean very small! At the moment my only opportunity to crochet is in the evening when I get home from work, and by the time we have had our tea, done the usual jobs and sorted the ironing, there is very little time to work on something that would take me months to finish if it were anything of any reasonable size. So, I thought that maybe creating lots of small things, rather than one big one, might be the way to go and would also result in me feeling as though I had actually achieved something. 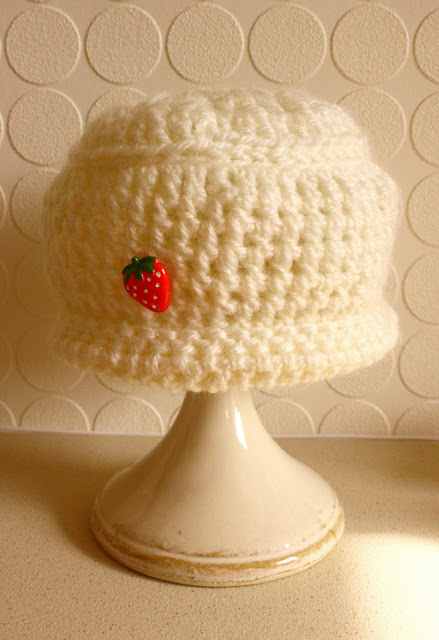 I also have lots of individual balls of yarn that would be suitable for projects such as this and children's/babies hats seemed like the ideal solution, but I would invent my own patterns as I went along, hopefully creating a more individual look. The first hat was started a couple of weeks ago, in a pixie-style, using a ball of cotton/bamboo mix. 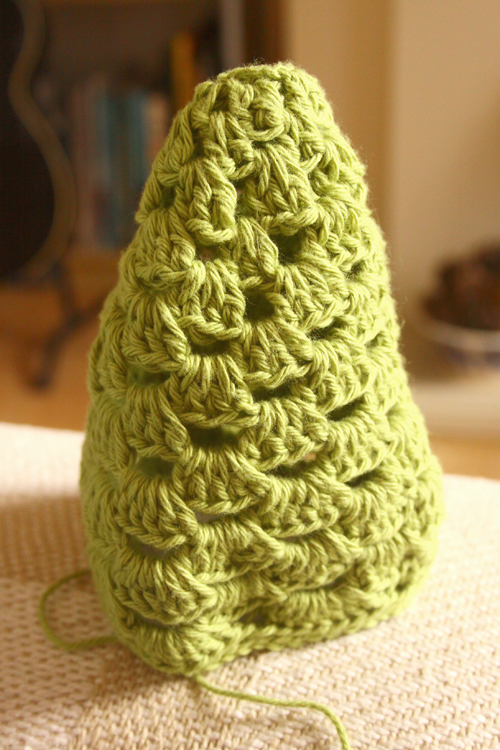 Worked in a granny-stitch pattern, it looked a bit like a crocheted Christmas tree at first (!!) but is very soft and warm to the touch with plenty of ventilation. 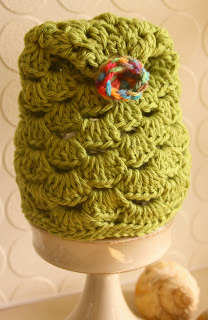 The top is then folded over, secured, and I then added a multi-coloured crocheted cup shape which is attached to the front for decoration and to break up the lime green. 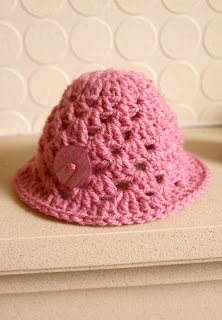 This hat is suitable for either boys or girls aged 0-3 mths. 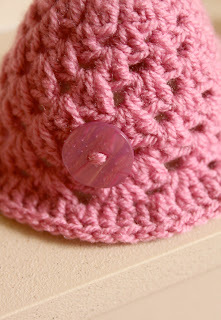 The next hat is even smaller and would be ideal for either premature or very small baby girls. It is crocheted from soft pink acrylic yarn, has a small brim to keep the sun out of little eyes and is decorated with a small pink button on the front left. This hat can also be worn with the brim turned up. 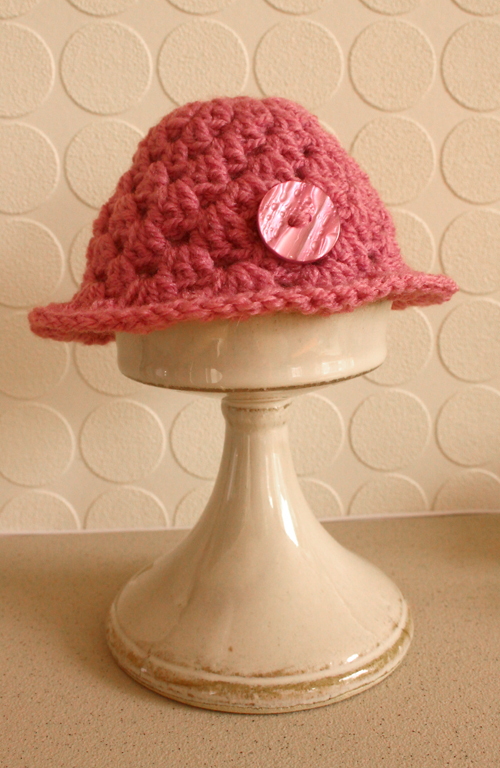 Finally for now, I have created a hat for girls aged 6-12mths. 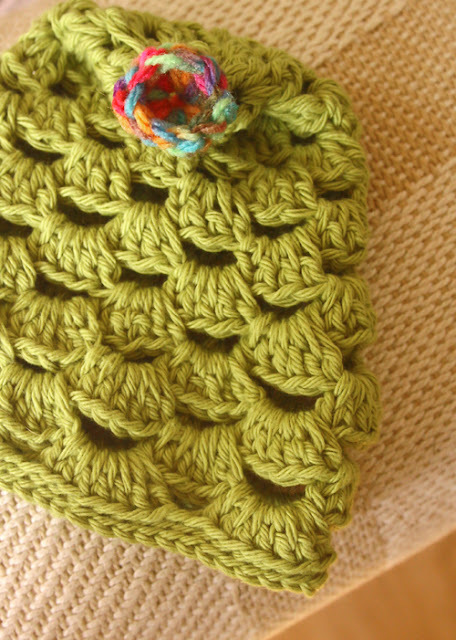 Crocheted in cream acrylic arran yarn, it started with a circular top. 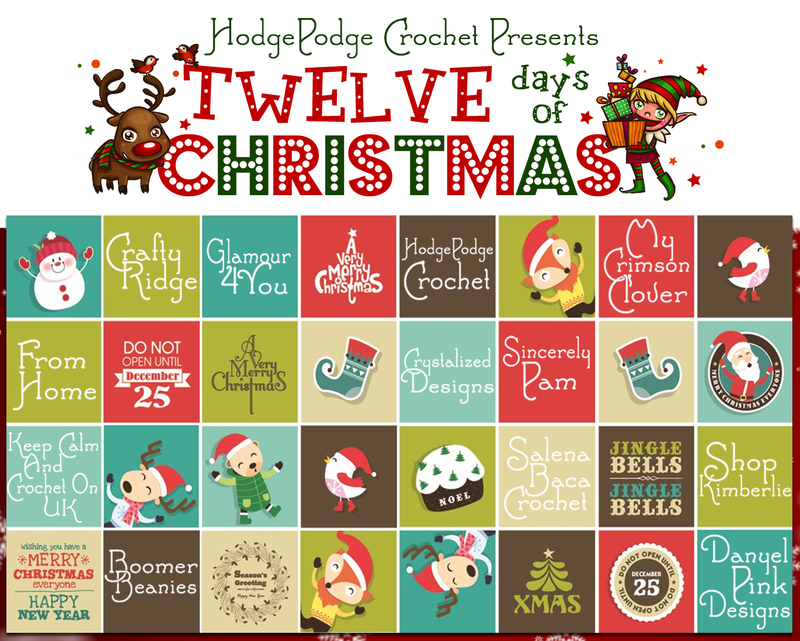 Onto this I then crocheted straight sides in a smaller stitch. It too can be worn with the brim up or down and has a small strawberry-shaped button attached to the front left. Warm enough for winter, it also has plenty of ventilation so that it is also suitable for slightly cooler late spring days too. I'm really looking forward to developing what I have learned with these three hats and making quite a few more. Oooh, these are darling! Wish I had a littlie to commission one for! The little finishing touches you have added are so right. They just make the hats complete somehow without being over the top. Now the question is, would they scale up for adults?! But I know what you mean, small projects that one can see the end of in the not too distant future have considerable charm as against big ones that it's a battle to finish! Thanks for the nice comments Elizabeth! I am looking to try slightly bigger hats when I get the hang of these but the satisfaction of finishing a smaller project is definitely the right thing for me at the moment.